The Be the Influence Coalition: A Windham Raymond Collaborative has been busy this year starting to dig into youth substance use prevention work and building capacity by recruiting members and forming subcommittees. The BTI Coalition, which formed in March of last year, has as its mission to promote community collaboration and positive choices in an effort to reduce youth substance use and abuse with attention on prevention and education for youth and adults in an effort to ensure a healthy community. The BTI Coalition aims to be representative of all those who interact with youth, have an interest in preventing youth substance use, and youth themselves and varies widely from school representatives to law enforcement to libraries to businesses and community organizations. The BTI Coalition recognizes the need for youth substance use prevention and the need for a community response. Tobacco use continues to be an ongoing problem for Windham and Raymond youth. According to the 2013 Maine Integrated Youth Health Survey (MIYHS), 19 percent of Windham High School students reported smoking cigarettes compared to 11 percent in Cumberland County. Twenty-two percent of Windham High School students reported marijuana use in the past 30 days. Alcohol remains the most commonly used substance by young people in Windham and Raymond. In 2013, 24 percent of Windham High School students reported drinking alcohol and 15 percent reported binge drinking in the past 30 days. To help with reducing these rates, and as mentioned in a Windham Eagle article earlier this year, the BTI Coalition has submitted a federal grant application for the Drug Free Communities Support Program. This grant could bring a potential $125,000 each year, for five years to the communities of Windham and Raymond as they work to strengthen community collaboration and reduce and prevent youth substance use. Aside from submitting the grant, the BTI Coalition has been busy increasing their numbers and forming subcommittees to address the various aspects of youth substance use prevention work. Some of this work includes creating youth action committees at each of the schools and gathering substance use policies to make sure they are aligned with best practice guidelines. The Youth Action Committee at Windham High School was recently invited to Jordan-Small Middle School for a meet and greet with the rising eighth graders. The goal was to assist the eighth graders in their transition to high school and help them discover ways to become active and involved in the high school community, learn more about the BTI Coalition, and become familiar with some of the new faces at the high school. BTI Coalition member and the Windham High School social worker, Doug Daigle, and the School Resource Officer, Officer Jeff Smith, were also involved in the meet and greet. Some of the plans for the summer and upcoming school year include reaching out to the business community to gain their support in youth substance use prevention, holding parent educational forums, working with school athletics to strengthen the substance use prevention message, and creating youth mentor groups around substance use prevention. This summer the BTI Coalition will be at both the Windham Summerfest and Everybody Hearts Raymond, ME events. If you are interested in becoming involved or learning more about the BTI Coalition, please visit our booth at either event. Interested community members are also encouraged to find more information on the BTI Coalition website: www.betheinfluencewrw.org or email the BTI Coalition at: betheinfluencecoalition@gmail.com. In April she released “Lenny the Lobster” from Tate Publishing and Enterprises. Having grown up in Ohio, she didn’t have a lot of ocean experiences. For the last 10 years, she’s been coming to Maine for family vacations, until she and her husband relocated to help run Bob’s Seafood in Windham, the family business. ‘Lenny the Lobster” is a rhyming book that features a lobster with a dream to “shine in front of an admiring audience.” The message in the book is to dream big and keep striving to achieve a dream. “Set a goal even if it takes 30 years pursue your dreams,” she told her class. Mathieu has received some comments about Lenny not being red. Her response was that “If he was red, he’d be cooked.” Even the art reflects the accuracy of a Maine lobster with one claw larger than the other. 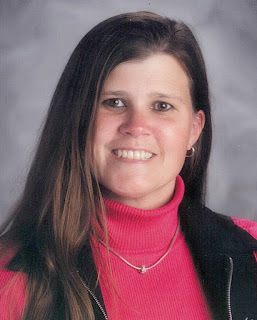 The sixth grade teacher at Poland Community School, also teaches a children’s literature class for the University of Phoenix. Her favorite book is “Library Mouse”, which inspires people that anyone can be a writer. Mathieu lives in Windham with her husband and two children, ages 7 and 12. “They like it. They were excited.” She even went into her younger son’s class and read the book to them. This summer Mathieu hopes to do book signings on the coast at area shops. 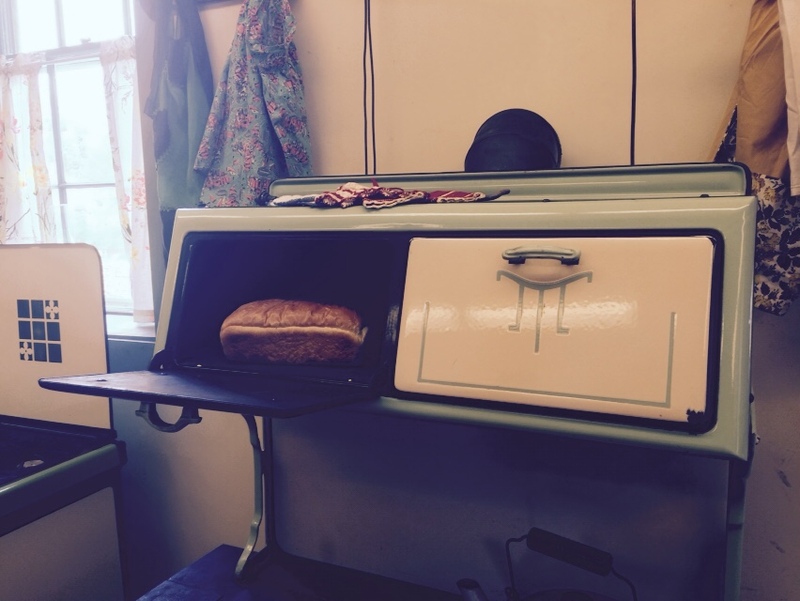 Step back in time by stepping in to a kitchen of the early to mid-20th century. 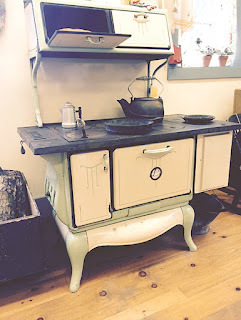 The Windham Historical Society has re-created the indisputable domain of grandmothers and great grandmothers, minus only the sweet smell of bread baking, bacon sizzling or soups boiling, mingled with the smoky scent of the wood burning stove. Windham’s Early Kitchen, a new display at the society’s Town House Museum, features a vintage cook stove, a Glenwood ice box, slate sink and dozens of cooking and serving aids and utensils from days gone by when electricity was a luxury and food was prepared by loving hands. The wood-fired American Magic-Chef cook stove, off-white with soft green trim, was a familiar and popular fixture of the early modern kitchen. The overhanging warming ovens would keep brown bread hot until the baked beans were served from a steaming brown and white pot. A cast iron skillet, which once fried fish filets and eggs, sits over round stove lids, fiery hot from the burning hardwood sticks below. Hugging the oven on the opposite side is a water chamber, an early version of running hot water. Close by, a wood-encased Glenwood ice box, no longer crammed with slowly melting ice blocks. 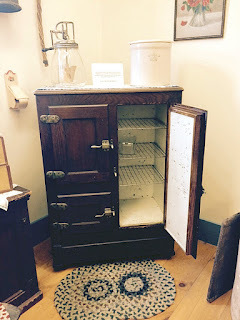 History reveals it was replaced in a Windham household by an electric refrigerator in 1939. 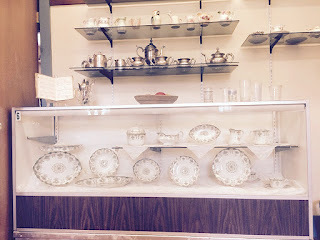 The pantry, lined with red and white checkered shelf paper, harkens back to days of home-made apple sauce, jam and canned goods. 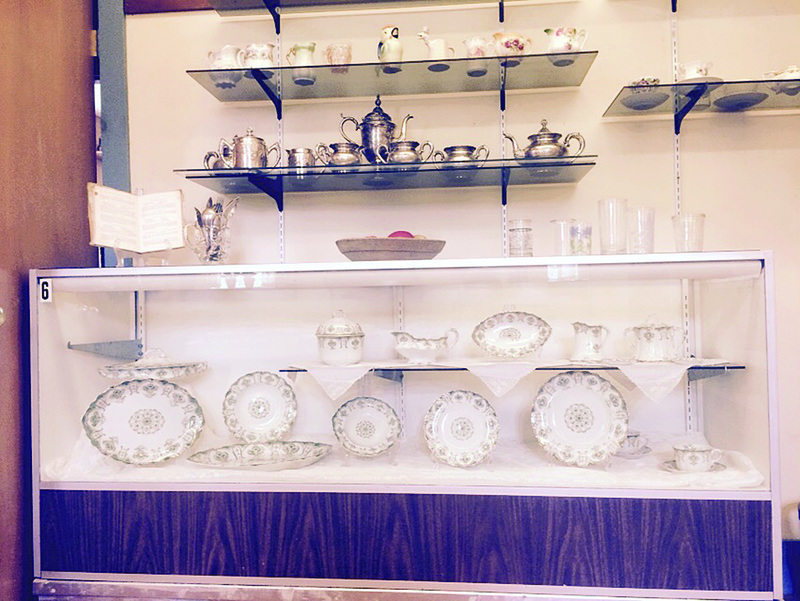 The silver plated tea set would be a show-off possession, displayed prominently on a high shelf, saved for use on special occasions. The center display is a kitchen table, “set” with a colorful table cloth and knives, forks and spoons beside the dinner plates, properly placed and ready for the traditional evening meal for the whole family that would share in discussions and news of the day. 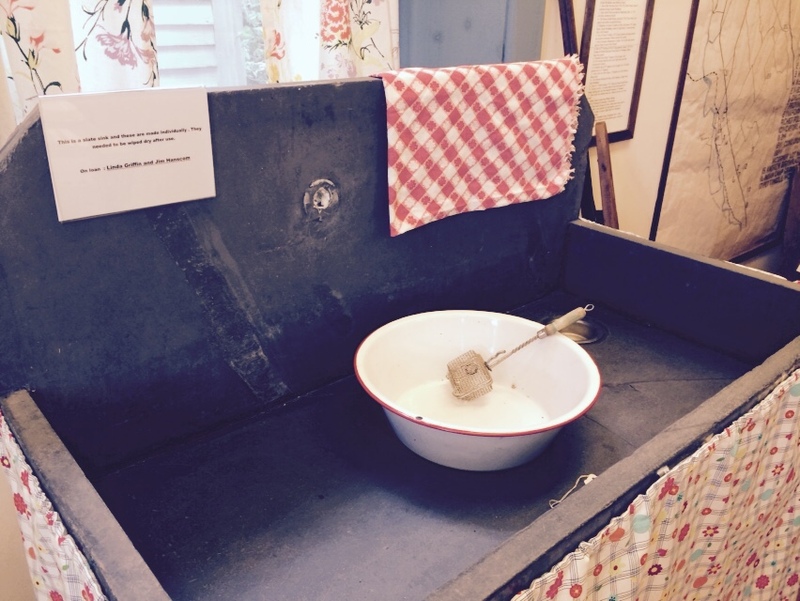 Dozens more early kitchen cooking aids and utensils complete the exhibit: Canister sets, potato ricer, red and white enamelware, food grinder, soap saver, soapstone and much more. Windham’s Early Kitchen remains on display through fall. Summer hours at the museum near Windham center are Tuesdays, Wednesdays and Thursdays 9 a.m. – 12 p.m., and some Saturdays. Call ahead. The library staff is gearing up for the end of the school year and turning our attention to the Summer Reading program. We have something for everyone this year! See a staff member for more information and to sign up. You will find games, reading incentives, prizes and exciting events throughout the summer. The themes this year are Every Hero Has a Story for children and juniors, Unmask! for the teens and Escape the Ordinary for the adults. Look for us in the Summerfest parade as well; we have a really fun float planned! Visit our website to see the calendar of events and all that is going on this summer. Have you browsed our new 3M Cloud Library? We added several new ebooks and eaudiobooks to our collection. Take a look and download one to your personal device today! Need assistance? The 3M Cloud Library has a wealth of helpful information right online or see a staff person next time you visit the library. We are glad to help! Planning a visit to a local park or museum? Speak with the Children’s Room staff about the passes we have to many of the local attractions. You can borrow a pass with your library card to the Children’s Museum of Maine, Maine Wildlife Park, USM Planetarium, Dundee Park, Maine State Parks, 19th Century Willowbrook Village and new this year passes to the Tate House Museum. Some passes allow free entry to the museum or park some allow discounted entry fees. When you are looking for something to do this summer, be sure to give us a call and see if passes are available. Don’t forget to visit the library website and click calendar to see all our events going on at the library. There’s something for everyone. On Friday afternoon, Manchester School paused to celebrate learning, literacy and more with a Mexican style carnival parade. Some parents and administrators were on hand to watch the procession. This is the first time the school has done something like this. “This all school integrated and connected event represented and highlighted art, music, movement, world cultures, classroom studies and more! What is better to make us shine but with a community, carnival and parade!” said Manchester art teacher Angelika Blanchard, who lead the carnival parade.